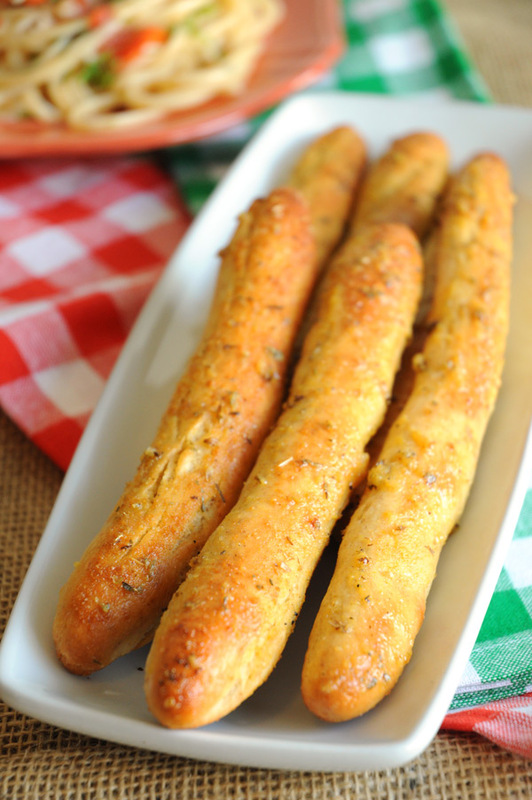 I’ve been searching for the perfect breadstick recipe for years. I’ve tried countless of them, and they all fell flat. Either they took 500 hours to rise (not really, but still – FOREVER), they didn’t rise at all, they were chewy, or they just plain didn’t taste good. Then – I found Marly’s recipe and life has never been the same. They’re light, fluffy, they rise in less than an hour, and they taste ridiculously good for being so simple. I’m in love. 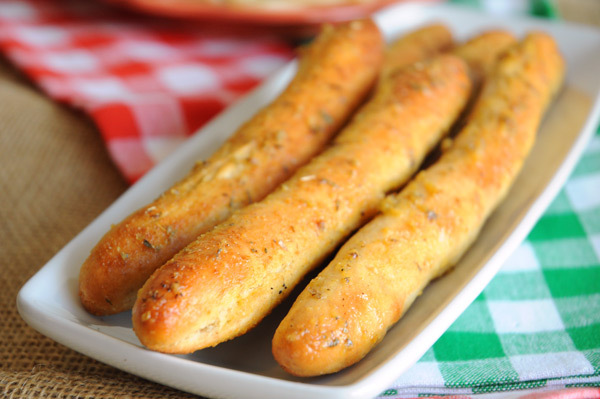 My breadstick kick is back, and I am now enjoying these sticks on a regular basis. 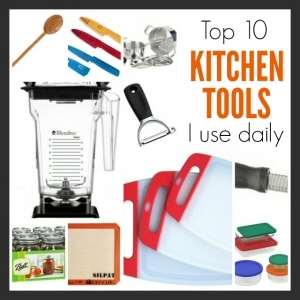 Instead of all-purpose, I use kamut flour. I just love the flavour of it (and I really hate using all-purpose). I also switched up the herbed topping ingredients for a bit more flavour. The next time I make these I’m going to try “pizza” flavour. Yum. 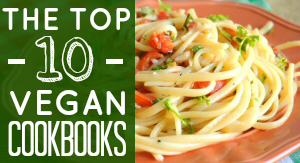 These would also be yummy with melted vegan butter, cinnamon and brown sugar instead of herbs. Mmmm hmmm. Just don’t serve those with pasta. That would be weird. Spray a large baking sheet with non-stick spray (or use a non-stick mat or some parchment paper). In a medium bowl, add water, sugar and active dry yeast. Stir and set aside until a proofed (about 10 minutes). In a large bowl, add the flour and salt. Stir to combine. Add the yeast mixture and melted butter mix well, until a dough ball forms. Place the dough on a floured surface and knead for a few minutes, until smooth. From the dough ball, pull golf ball sized pieces and roll them into balls, then into long pieces. Add to your baking sheet. Preheat your oven to 150F. Once it reaches that temperature, turn it back off, and place the breadsticks in the oven. Now they have a warm place to rise. Allow them to sit in there for about 35 minutes. Remove breadsticks from the oven and heat to 375F. Add all ingredients to a small bowl and mix well. Spread half of the mixture onto the breadsticks (after they have doubled in size, and before you bake them). 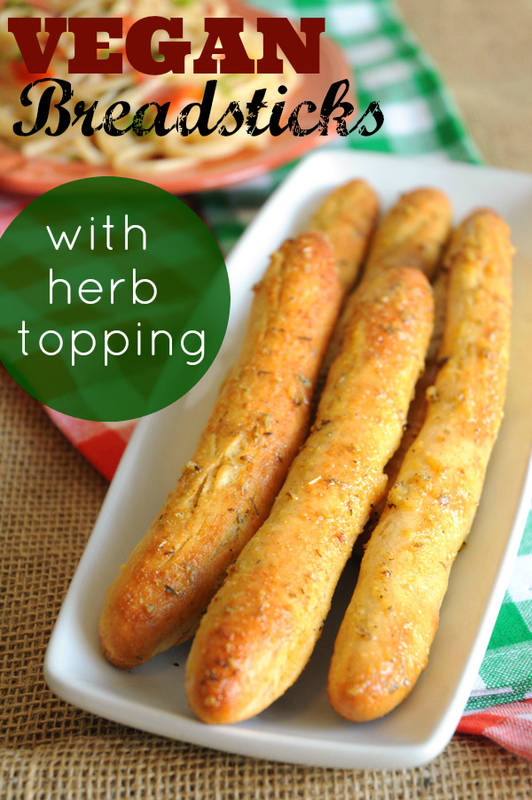 Bake the breadsticks in the oven for about 15 minutes, then remove and spread the rest of the herb topping onto them. These were fantastic! Used freshly ground kamut and they are delicious. Love the herbs on top.